Wahclella Falls in the Columbia Gorge is a top family-friendly hike as well as a more serious destination for Oregon hikers and photographers. Wahclella Falls is located near the Bonneville Dam and is by far one of the most prettiest and most powerful waterfalls in the Columbia River Gorge area. The falls is fed by in the impressive Tanner Creek with an upper drop of 290 feet and the second tier dropping into a 75-foot horsetail at the pool below. The Mazama mountaineering club named the falls “Wahclella” in 1915 after the nearby Native American village. With additional springtime water flow, you can see between the two tiers of Wahclella Falls, a smaller and seasonal East Fork Falls. However, you must hike up and find a vantage point the right (west) side of the creek for viewing. These three levels of Wahclella Falls ads a bit of interest since the falls can be three different lengths depending on the time of year you are visiting. 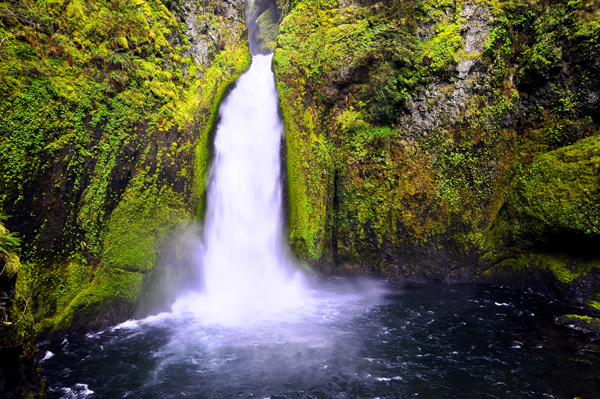 The plunge pool of Wahclella Falls is highly scenic due to the surrounding moss and fern-covered stone walls that form a semi-circular amphitheater extending from the falls to the main viewing point along the hiking trail. When the lighting is just right, the scene displays spectacular emerald green walls and an alluring sapphire blue pool which is prime for color photography. As with most waterfalls, Wahclella’s water flow can vary with the changing of the seasons. However, because Tanner Creek is sourced primarily by an underground spring, the flow is never dramatically affected by adverse weather and for much of the year, there is significant and impressive outflow from Wahclella Falls. When up close to the waterfall, you can appreciate and feel the power of the water from it’s mighty 75-foot drop. At the base of the falls, there are many large boulders to climb, logs to explore, and small pools to wade through, creating photo opportunities and fun for the family too as long as there is a mindful eye. As quite a bit of volume pours out of this waterfall, the relentless spray can be difficult to manage when photographing. An overcast day for photographing this waterfall is essential. Additionally, an early morning start is recommended as the sun will rise above the falls roughly at noon and the photography opportunities will dramatically decrease once this happens. 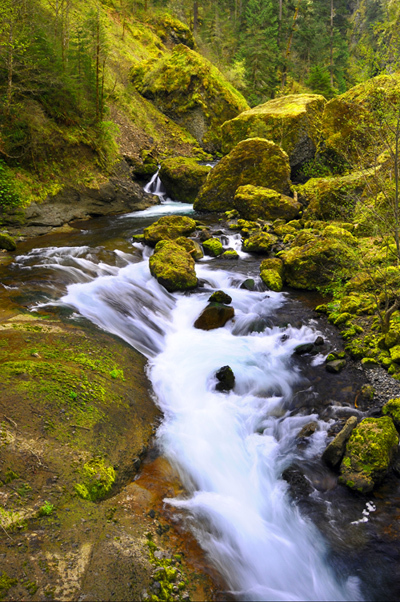 There are plenty of postcard worthy photos you can take too along Tanner Creek, so be sure to not not overlook this creek while on your way to the main falls. The setting has a more wide-open landscape view with countless moss covered rocks and scattered pine trees. It is a beautiful example of the greenery and remarkably pristine nature of the Columbia Gorge. Additionally, along the cliffhugging trail there are a few smaller or thinner waterfalls such as Munra Falls which actually is right beside a footbridge before joining up with Tanner Creek and makes for a great vantage point. 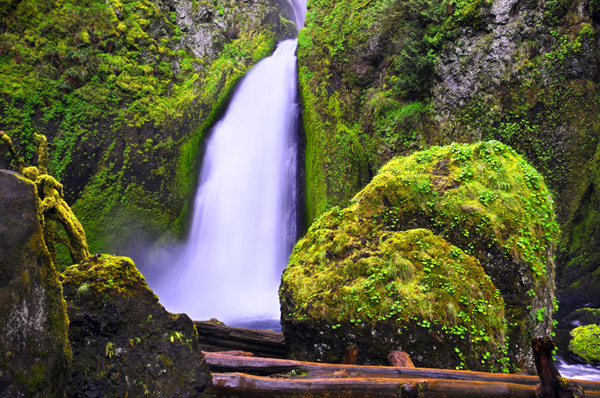 From the beginning of the hike to the base of Wahclella Falls, the trip is an enjoyable afternoon excursion to experience the beauty of the Columbia Gorge. For more pictures of waterfalls in the Columbia River Gorge, visit www.photographyoregon.com. The Wahclella Trailhead can be easily found by taking Interstate 84 off of the Bonneville Dam Exit (Exit 40). After taking a right off the exit, drive approximately a mile until you reach the Wahclella Trailhead. The trail is well maintained and an easy hike of nearly 1 mile with just a 300 foot elevation gain. Accessible to nearly everyone; it would make a great family and dog hike. Oregon Photo Guide™ features the landscape photography of Michael Skourtes, Portland Oregon photographer and avid outdoorsman. I venture throughout the state searching for the top destinations for Oregon hiking, backpacking, camping, and photography. I share my experiences and photography of Oregon on my guide. I encourage you to explore Oregon and make your own outdoor adventure.